I am so proud of my babies wonderful homes I have decided to add comments from their human parents. Click the above photo to see Wolfy Pekes Blog! Pictured are Midnight and Wolfgang. Owned and loved by the Kayes. Photo courtesy of Dr. Tony Kaye. 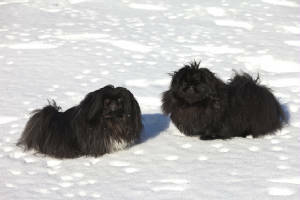 We met Ms. Forsyth in December of 2008 after an exhaustive search to find a Pekingese breeder with the "right stuff." From our first discussion, we knew that she was the breeder for us. 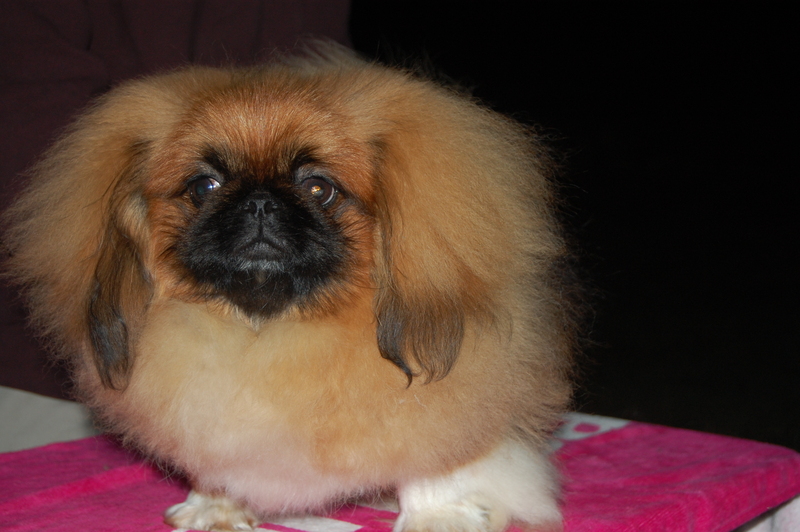 Healthy, happy Pekingese with well-documented breeding and perfect health were what we found at her home. 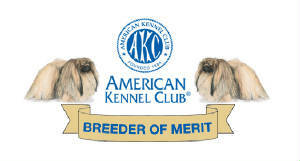 As evidenced on her website, her breeding skills have paid off, as several of her dogs have won awards in key dog shows. Further, being greeted by a small herd of fluffy, happy, well-socialized little Pekingese in Ms. Forsyth's home sealed the deal. Not content to be "just a breeder," we continue to have an excellent relationship with Ms. Forsyth. 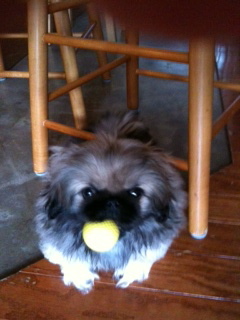 Anytime we have a question about anything Pekingese-related, she knows the answer. We are the proud parents of two children from Ms. Forsyth's kennel, and we couldn't be happier. A few words from proud mom! Thank you Millie for being such a wonderful home! Look forward to seeing you both at shows! 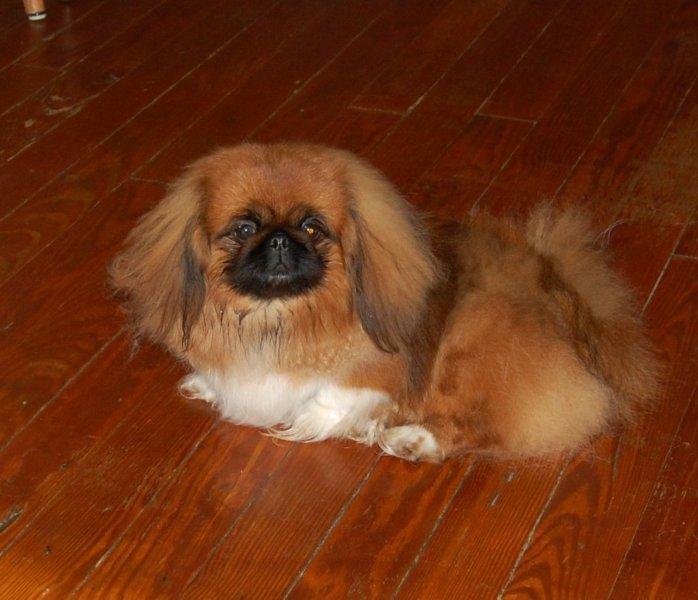 I contacted Carrie in January, 2011 looking for a new Pekingese baby for our family. My black male had passed away in June of 2010 and would have been 17 years old in November. I had been searching for a small black male for a couple of months but wasn't having any success. Amazingly, Carrie had just had a litter of black puppies born on December 24. Carrie and I spoke on the phone many, many times and emailed many more. I received photos via email on a regular basis and pup updates regularly until it was time for my little guy to come to his new home. I was immediately impressed with Carrie's knowledge and love for the bred. Her Pekingese are her children and it shows. She raises happy, healthy, well-socialized babies. 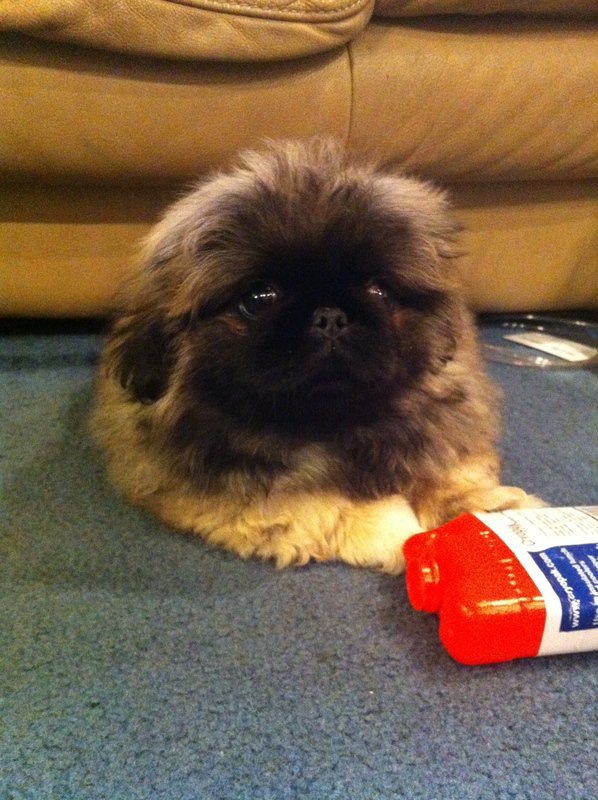 This is my third Pekingese and he is by far the most personable and well adjusted. I immediately fell in love the moment I saw him. Carrie has been extremely helpful to answer any and all questions I have had....she is a wealth of knowledge. I know that I will always be able to go to her for advice and training for my new baby. Carrie goes above and beyond what anyone would ever expect from a breeder. Introducing : Roll-About's Lord Of the Rings " Edward"
After my Squiggy died, I never thought my heart would love again. 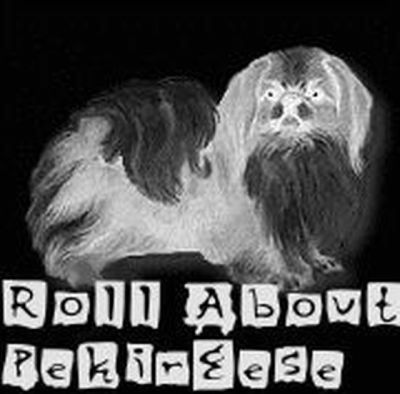 In searching for answers and to learn more about Pekingese, I met Carrie Forsyth. Not only did she help me through my roughest time, but I'm blessed to have made a lifelong friend. She is by far the best breeder I have ever known. Her years of experience and knowledge of the breed shows and shines in the wonderful little loving Pekes that she breeds. No one will find anyone with greater integrity. Every time we speak, I learn something new. 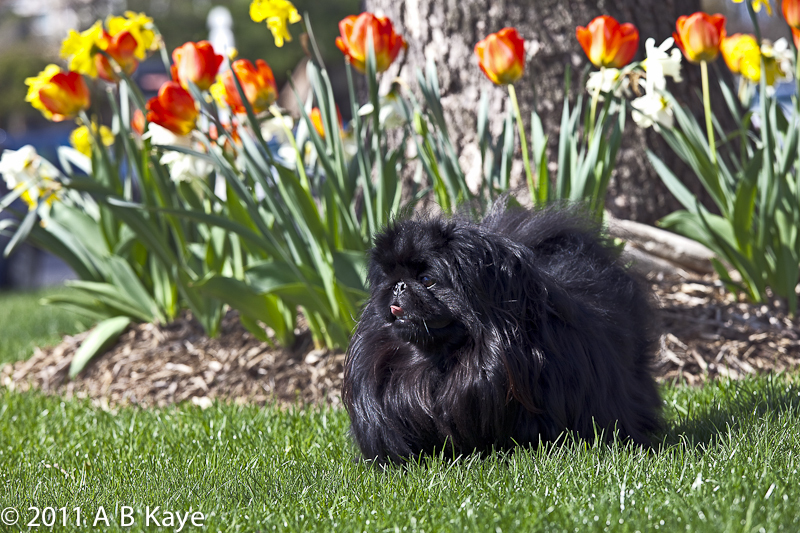 Carrie takes such great care in her Pekes, it is most impressive to see flawless documentation of bloodlines and champions! I am so thrilled to have a new little man in my home. My family has welcomed a happy, precious new puppy, and I am excited to watch him grow into the fabulous show dog and family doggie I know he will be. While my heart will always love my Squig, it has found new love in my puppy, Edward, and in my new friend, Carrie. Roll-About's No Ka Oi " Noki " Meaning The Best "
I am a mathematics professor at a community college in New York. My dad was a vet and we grew up with all kinds of animals... dogs, cats, horses, mules, goats. My first three dogs were peke's. 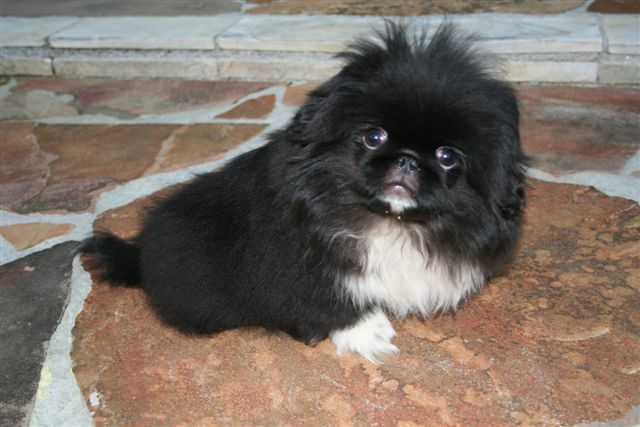 My first peke was brought in to be put to sleep because someone had dropped her and her eye had popped out. My dad told the owner he would not put her to sleep, but put the eye back in and give her to his daughter (me :). Her registered name was Princess Chewy. Chewy lived for 11 years. 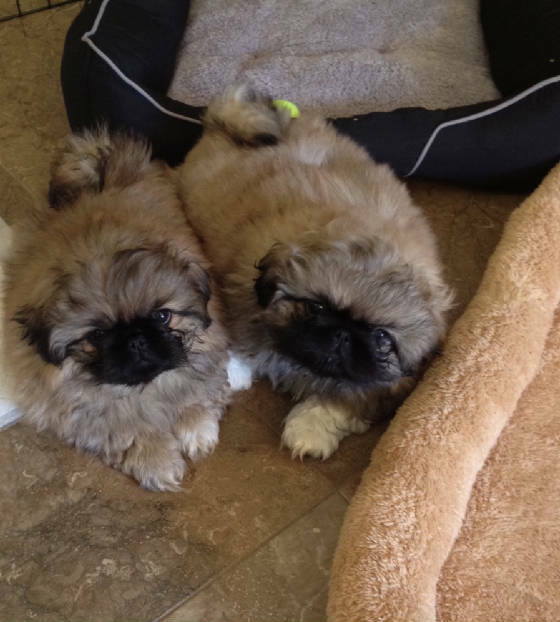 My next pekes were brought in to my dad to have a good home found. One was a retired show dog, Nippy, the other was the pick of his last litter to whoever gave him a home. My grandparents took Nippy and the puppy (Missy). They were killed in a car wreck in 1965. We took Nippy and eventually ended up with Missy as well. Nippy lived a nice long life, and Missy lived for 15 years. My parents then went off on a Yorkie stint... 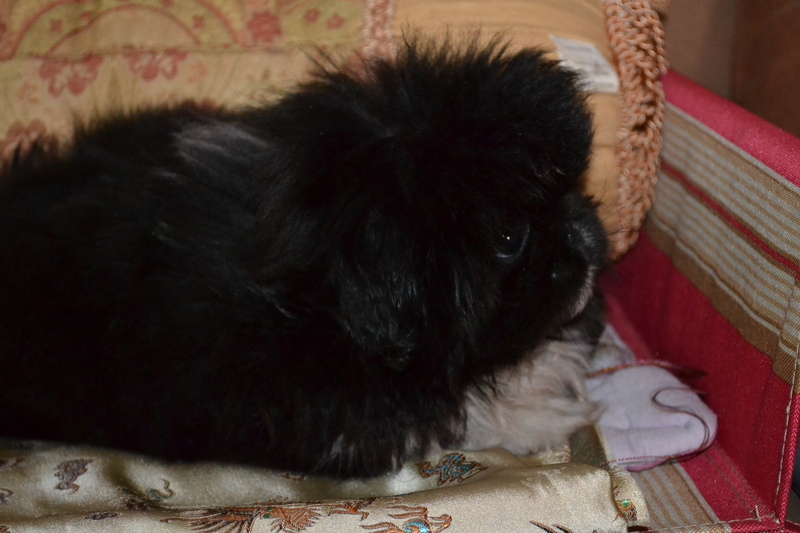 Loved those little yorkies, but love peke's more. I was so excited to find Carrie and her Roll-About Pekingese's! My little Noki is "Roll-About's No Ka Oi". "No Ka Oi" means "is the best" in Hawaiian. My family has been to Hawaii many times. My dad loved Maui where there is a saying "Maui No Ka Oi", so Noki's name is in memory of my dad and all the wonderful times he had in Hawaii. Dennis and I wanted to send you a note to say thank you for helping us to add two magnificent family members to our home and our lives. They are absolutely gorgeous, smart and funny. I have meant to send you this note for a long time, even prior to getting the puppies. After putting down a deposit and falling in love with two dogs that came from a backyard breeder that lied to us, our hearts were broken when we had to walk away from those dogs. From the first time we spoke, you gave me a peace of mind that we would be getting two healthy and sound dogs to join our family. In the following two months you spent so much time talking to me about what to expect, how to prepare and showing your dedication to the breed. You have certainly followed through with your commitments and made the process easy and stress free. Buying dogs can be very confusing and there is a lot of conflicting information out there, you made the process easy and we have felt confident in our decision to go with you from the beginning. You are a consummate professional, an extremely caring and generous person and I am very happy to now call you my friend. You have introduced me to the larger “Peke family” and offered priceless resources to ensure that our dogs are happy and healthy (and well groomed). It has been such a nice experience to be brought into a social mix of people who truly appreciate the breed and are dedicated to their well being. 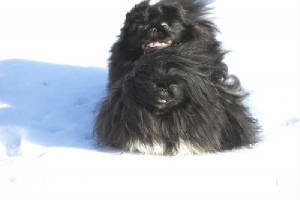 I find it particularly impressive that you rescue and care for other Pekingese that are not able to be placed, either because of age, health or temperament. Now onto the dogs, they are perfect. Their coats are full, even at 9 weeks, their heads are big, they seem perfectly proportioned from what I have read about the breed. Their temperament is sweet, loving, social and playful. I am amazed that after only being in our house for less than 24 hours they are completely pad trained. Both are already following us around and I expect they will be amazing in the ring if we choose to go that route. I am happy to be a reference to anyone considering using you for a companion or show dog breeder. Please feel free to pass along my information. As a small token of our appreciation we have sent you something (via UPS) that should arrive early next week. I hope you like it.